It is ugly and egregious that Minister Louis Farrakhan’s current campaign to promote peace in the streets is being attached to an alleged history of anti-Semitism. Nearly every publication that has covered the Minister’s efforts has felt the need to rehash baseless lies, seeking to destroy the magnetism between the Minister and the People. Back then it was the Jewish Sanhedrin that opposed Jesus’ public ministry. Today it is the ADL and its Zionist affiliates that oppose Minister Farrakhan. The Bible’s history of Jesus is very important in any analysis of the phenomenal presence of Minister Louis Farrakhan. This is because Minister Farrakhan is unique. Most religious and secular leaders within America’s Judeo-Christian landscape are comfortable deifying Jesus as an object of worship. Minister Farrakhan as a Muslim enacts what can be defined as a Jesus Leadership Model. The Jesus Leadership Model is characterized by a leader’s ability to demonstrate self-sacrifice, longsuffering, courage and magnetism. The above quotes are Jewish admissions that their hatred of the NOI did not arise out of any legitimate cause for concern. This began Minister Farrakhan’s crucifixion on the cross. In Roman times, crucifixion on the cross was meant for pain and humiliation. 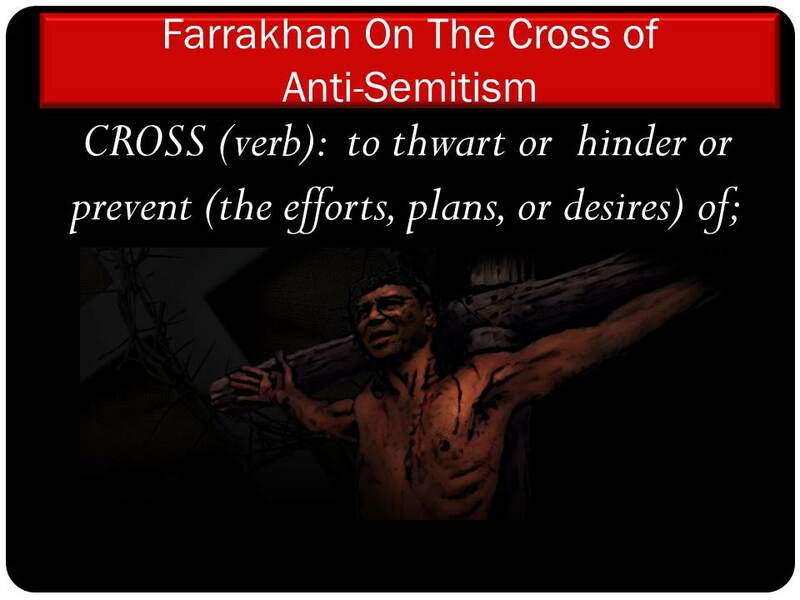 And while the charge of anti-Semitism is meant to embarrass and injure the public profile of the person so charged, it also signifies the crossing out, thwarting, undermining and sabotaging of Minister Farrakhan’s plans to help suffering Black America. In other words, the Zionists set out to murder the Minister’s plans and programs. Jesus, according to the Bible, had his hands nailed down and Minister Farrakhan had his economic initiatives destroyed. Jesus was a carpenter by trade, so to nail down his hands was to hinder his ability to construct, build and repair. This would destroy a man who made his living through the work of his hands. And even though Jesus gave up his profession to devote himself to his ministry, it is easy to see that the nailing of his hands would destroy him economically. Symbolically, the Jewish leadership has thwarted the Minister’s ability to build up the Black community spiritually and economically. And every time Minister Farrakhan begins an economic program, his efforts are stymied by the ADL and those that it controls. When Minister Farrakhan received a $5 million dollar loan from an African head of state, Libyan leader Muammar Gadhafi, he started a personal care product line called P.O.W.E.R. (People Organized Working for Economic Rebirth). His purpose for the funds was to develop an economic base in the very lucrative Black hair and personal care product industry. This initiative was crossed out when Jewish distributors threatened Mr. George Johnson of Johnson Products that they would not distribute his products any longer if he followed through on his agreement to Minister Farrakhan to manufacture the products. In addition, because of Jewish pressure the Black-owned Independence Bank of Chicago demanded that the Minister take the $5 million dollars that he deposited with them out of their bank. As part of his crucifixion Jesus was pierced in the side of his body. In Minister Farrakhan’s case it was the body of his organization. His followers and the communities they serve suffered when the ADL pressured the U.S. Housing and Urban Development (HUD) to end security contracts with NOI Security. 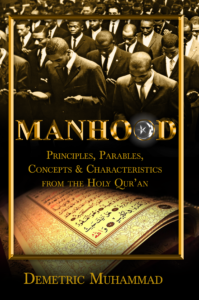 Many remember when the male members of the Nation of Islam organized themselves to perform security patrols in some of the most drug-infested and crime-ridden apartment complexes in the country. The Muslim brothers of the Fruit of Islam (FOI) established security companies to provide safety and security to poor people living in public housing. But Jewish pressure on the Congress thwarted this successful economic and social services initiative by the Nation of Islam. Republican Jack Kemp and former first lady Barbara Bush were among many who praised the Nation of Islam for their work in securing vulnerable neighborhoods. This analogy concludes by considering the interference Jewish groups have made to hinder Minister Farrakhan’s movement among his people. This can be likened to nailing his feet to the cross. And when one’s feet are nailed, movement is hindered. Minister Farrakhan’s desire has been to go among his people to teach them and to bring them a better quality of life. His desire has been to make the Black man and woman of America the equal of the best of civilized people. There are many examples of Jewish groups protesting the leaders Black people choose to listen to and follow. A classic example of this is when in 1993 Minister Farrakhan was disinvited to speak at the 30th anniversary of the March on Washington. He was invited initially and then disinvited after Rabbi David Saperstein complained. The Black organizers of that march gave in. They disinvited the man whom divine providence blessed two years later to convene the largest March in American history—the Million Man March. The case of Minister Louis Farrakhan’s crucifixion is part of the terrible legacy of the Crucifixion of Black Leadership. It’s time for our affliction to end.